Joseph Knight Sr., born in Oakham, Massachusetts on 26 November 1772, was a close associate of Joseph Smith. He provided significant material support to Joseph’s translation and publication of the Book of Mormon. In 1795, Knight married Polly Peck. Five years later they were living in Vermont, and in 1808, they moved to Colesville, New York. Along with his second wife, and thirteen children, he established a sawmill in Colesville. He first met Joseph Smith while Joseph was working for Josiah Stowell in 1825. Joseph was 20 years of age at the time. In late 1826, he hired Joseph to do farm work and to work at the sawmill. Joseph told the Knight family about seeing God the Father and the Son six years earlier near Palmyra, New York, and also about the Gold Plates he was preparing to receive. The Knights were impressed with his story. Joseph Knight Sr. was also instrumental in Joseph Smith’s courtship with Emma Hale. “I paid him the money and furnished him with a horse and cutter [sled] to go and see his girl.” The Prophet even used Knight’s wagon to retrieve the gold plates from the Hill Cumorah. Joseph Knight Sr. was baptized a member of The Church of Jesus Christ of Latter-day Saints on 28 June 1830. All his children, their spouses, his sister, and three of his wife’s siblings along with their spouses joined the church. 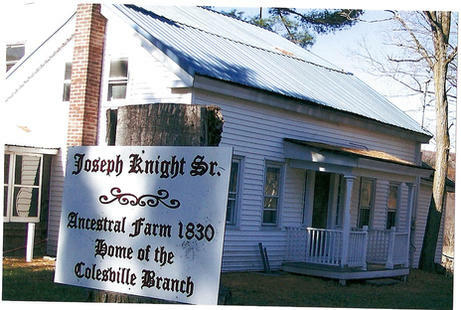 The Knight family constituted the Colesville Branch, the first branch of the church. Hyrum Smith served as the first Branch President, followed by Newel Knight, one of Knight’s sons. They met in the Knight family home. The Knight farm was the location of the Prophet Joseph Smith being arrested for the first time on 28 June 1830 following the organization of the church. Charged with “being a disorderly person by preaching the Book of Mormon, and setting the country in an uproar,” he was put on trial, but acquitted of the charges against him. Knight died at the age of 74 in Mt. Pisgah, Iowa on 3 February 1847, after the Saints’ expulsion from Nauvoo, and before reaching Utah. The Joseph Knight Sr. home in Nineveh, New York (formerly Colesville) located 23 miles north of the Priesthood Restoration Site of The Church of Jesus Christ of Latter-day Saints in what was once Harmony, Pennsylvania, underwent a 12-year restoration process. The home, owned by Raphael Mecham, one of the directors of the restoration project, and his brother-in-law, Steve Glenn, located at 1963 E. Windsor Road, Nineveh, New York 13813, and is now open for public tours from 9 a.m. to 6 p.m. Monday to Saturday and 2-6 p.m. on Sundays. They purchased the home in 2004 after it had fallen into severe disarray, however, due to foreclosure laws, they did not take ownership of the home until August 2005. Once they had ownership, they invited the Painters family to help with the restoration project. According to Mecham, the original plan was to renovate the home, but in 2006, they received a spiritual prompting that the house should be restored and preserved. Approximately 75 to 100 people assisted in restoring the home – people including an electrician, a blacksmith, and missionaries on their preparation days. Great article except for 1 incorrect statement; Joseph Knight did not have a second wife in Colesville and did not have 13 children…..